In today's volatile and highly competitive market, oil and gas companies must quickly discover and operationalize transformative digital technologies, optimize production capacity, adhere to shifting HSE regulations and increase recovery rates. 83%* of surveyed customers in the oil and gas industry use Knovel in new product development or to improve engineering outcomes. For today’s oil and gas companies, success requires investment in scientific and technical insights about proven and emerging approaches, data management and process improvements. And, that’s not all; these companies also must invest in technology partnerships for reducing risk in E&P investments and identifying immediate operational improvements. Knovel can help. Refining and petrochemical companies must develop and apply innovative technologies to ensure business continuity and achieve operational excellence. Knovel can help reduce downtime by optimizing new process technology, equipment and catalyst technology, reduce energy usage, and improve environmental performance and sustainability. Corrosion is a major concern for shale gas well equipment during low-throughput periods. Current standard methods are costly and lead to nonproductive periods. 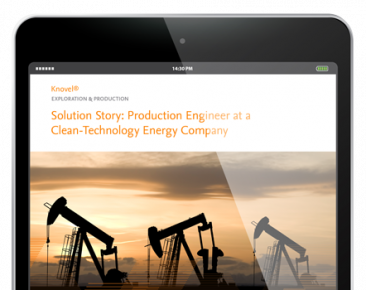 Thanks to Knovel providing access to a broader range of resources, one process engineer found a new solution that reduced downtime and cost significantly.